After the new selection criteria had been adopted and the re-application process had been launched, the Directory of Open Access Journals (DOAJ) has established itself within the European framework as a respectable "white list" of legitimate Open Access journals. Realizing the importance of the improved DOAJ and the necessity of local journals to achieve international legitimacy, CEON/CEES decided to develop an organizational scheme and a web application intended for collective application of SCIndeks journals to DOAJ. The system called Policy and Licensing Support Service (P&LSS) assist journal editorial boards in defining their publication policies in accordance with international ethical standards and good practices in scholarly publishing, while primarily focusing on new DOAJ selection criteria. The service was developed as part of an internationally funded project aimed at the technical improvement of SCindeks. P&LSS is available as a module within the Editor Service. For obvious reasons, its use is restricted to the journals subject to quality control in SCIndeks. 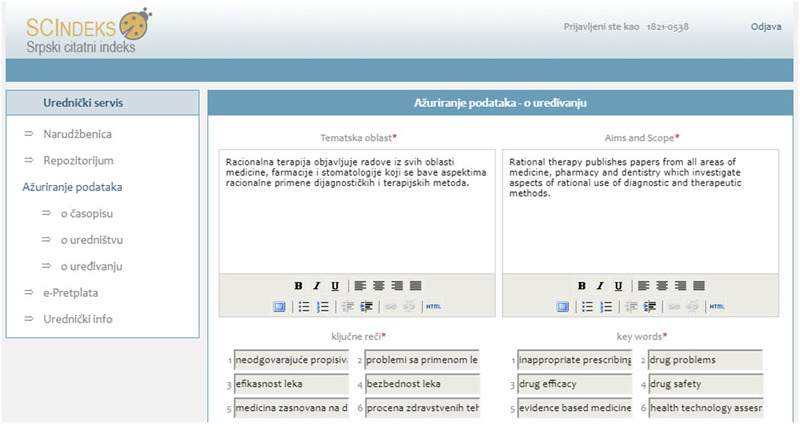 The various sections of the module (Reviewing procedure, Responsibilities, Ethical publishing, Open Access, Copyright & Licensing) are pre-filled with recommended policy provisions, fully compliant with DOAJ selection criteria, and the editorial staff is expected to adjust the pre-filled text so as to make the final policy reflect the journal’s actual policies and practices. The changes made by the editorial staff are subject to verification by the SCIndeks development team. Only after the verification, the text of the publication policy becomes available on the journal’s pages in SCIndeks. Once this process is completed, the SCIndeks development team submits the application to DOAJ on behalf of the journal, with the consent of the publisher. Immediately after a journal is accepted by DOAJ, SCIndeks team uploads metadata for all journal's articles existing in SCIndeks, using a predefined XML schema. Also, it starts to re-index in DOAJ, regularly and timely, all newly published issues/articles of the accepted journal. Thanks to DOAJ’s established authority, article metadata are further disseminated through harvesting by numerous other services, thereby contributing to the journal’s global visibility. P&LSS greatly supports the work of the editorial staff by providing clear guidelines for defining the publication policies and improving the existing practices in the form of ready-made, verified solutions. By indexing in DOAJ through SCIndeks, editors ensure not only the full legitimacy for their journals at the European level but also the presence of their metadata (article descriptions and abstracts) in an international database of growing importance. Moreover, this is achieved in an automated way, at no additional efforts and costs. Since the launching of P&LSS, as many as 48 journals have been accepted for indexing in DOAJ through SCIndeks, and another five journals are still under evaluation.